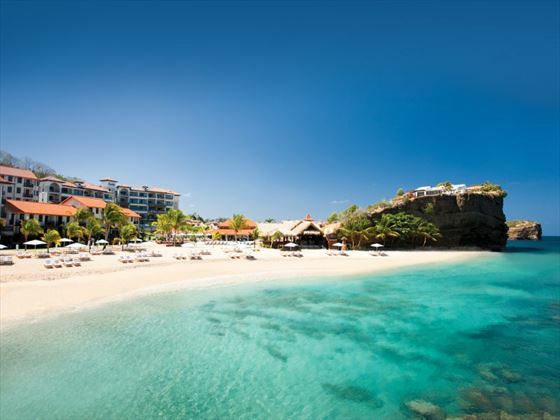 Newly reimagined and renovated, Sandals Grenada sits on the beautiful Pink Gin Beach basking in the Grenadian sunshine. This romantic and luxurious resort is ideally located close to the airport, meaning that you virtually step off the plane and into your holiday. 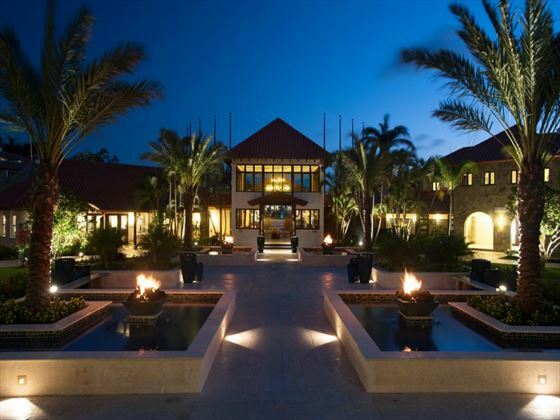 An exotic dose of paradise, this chic resort creates an experience that is unique and unforgettable. With three pools, two river pools and a modern spa and fitness centre, we think staying here will be something very special. It’s also adult-only so you can be assured of a restful experience. We love the range of stylish rooms on offer – there are 21 different categories of rooms and suites, including intimate settings overlooking the ocean to large honeymoon suites perfect for an unforgettable Caribbean experience. 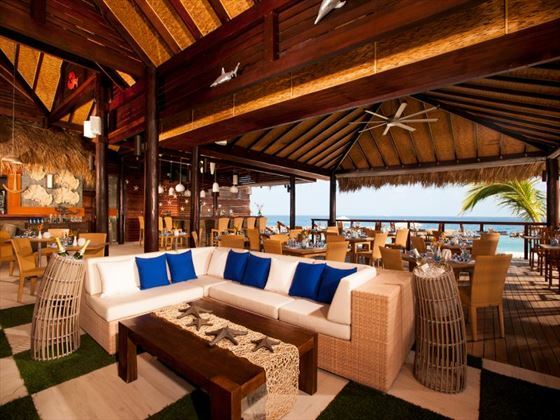 The food is a very big part of a fantastic tropical holiday, so the fact that Sandals Grenada boasts nine restaurants, including a fine steakhouse, will be music to the mouths of discerning holidaymakers. Top Tip: Paying the extra to stay in the Italian Village – the part of the resort with professional butlers to serve you – is worth the money if you’re looking for the ultimate in relaxation and opulence. Located on the south-western tip of Grenada, Pink Gin Beach is a gorgeous white sand beach, offering traquility and natural beauty for a romantic touch. 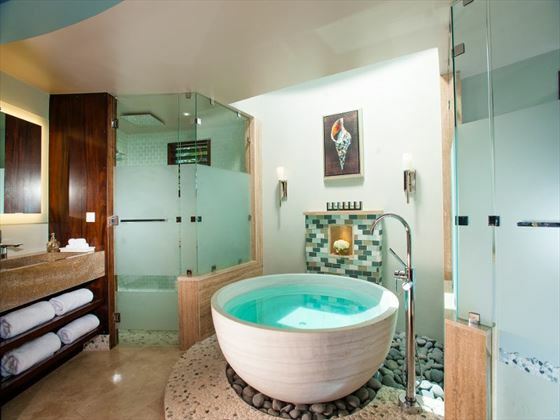 South Seas Premium Room with Outdoor Tranquility Soaking Tub - Tranquil rooms featuring the standard amenities, with a balcony or patio looking out onto the lush gardens. 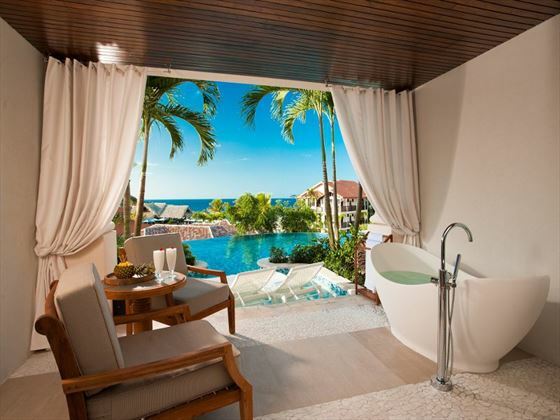 Pink Gin Grande Luxe Room - Caribbean-styled rooms with partial ocean views. Pink Gin Hideaway Room with Patio Tranquility Soaking Tub - Contemporary rooms featuring a spacious patio with two lounge chairs and partial ocean views. Lover's Lagoon Hideaway Junior Suite with Balcony Tranquility Soaking Tub - These lovely suites are located in the Lover's Hideaway Village, offering lovely views of the freshwater lagoon from the large balcony. Lover's Lagoon Hideaway Walkout Junior Suite with Patio Tranquility Soaking Tub - With the same location as above, these time with a large patio overlooking the azure lagoon. South Seas Honeymoon Poolside Hideaway Junior Suite with Balcony Tranquility Soaking Tub - Spacious suites entered through a covered vestibule, with a lovely balcony and a walk-in shower. Boasting romantic views of the pool and verdant gardens. 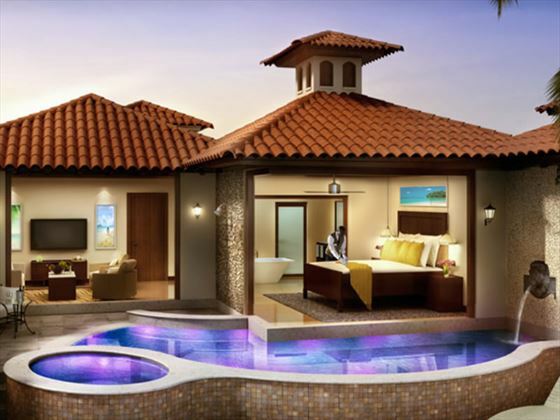 South Seas Honeymoon Poolside Hideaway Walkout Junior Suite with Patio Tranquility Soaking Tub - Enter your stylish retreat from your own patio, discovering a suite with a walk-in closet and chaise lounge outside. These rooms walk out to one of the radial pools. South Seas Waterfall River Pool Junior Suite with Balcony Tranquility Soaking Tub - Discover your luxury suite from the covered vestibule, entering a suite that boasts a spacious balcony with an outdoor dining space, a free standing Tranquillity Soaking Tub for two, and beautiful views of the waterfall pool. South Seas Waterfall River Pool Walkout Junior Suite with Patio Tranquility Soaking Tub - Enter your suite via your private patio, adorned with a chaise lounge and views of the waterfall river pool. Pink Gin Oceanview Room - A classy room with marble floors, a table for in-room dining, and a balcony overlooking the ocean. Pink Gin Beachfront Room - Inviting rooms, boasting a wonderful beachfront location, a smart TV, marble floors, and a large dining table. Pink Gin Oceanview Club Level Suite - Spacious and chic suites, featuring a living area with a sofa, chairs, a cocktail table and even a bar. 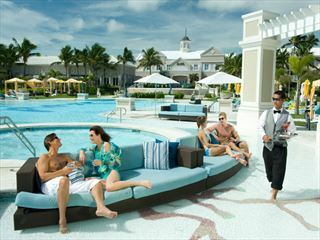 The suites also boast ocean views and Club Sandals* service. Pink Gin Oceanfront Honeymoon Penthouse Club Level Room - You'll find these elegant rooms in the Pink Gin block, offering a large dining table, marble floors, lovely ocean views, and Club Sandals* privileges. Pink Gin Beachfront Walkout Club Level Room with Patio Tranquility Soaking Tub - Indulge with a coveted beachfront location, offering direct access to the sugary sands. 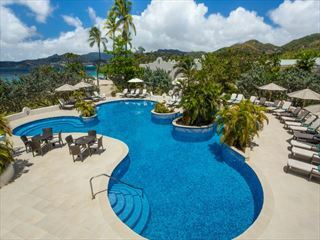 These rooms also boast a patio with two lounge chairs, panoramic sea views, and Club Sandals* perks. Pink Gin Beachfront Honeymoon Club Level Suite - Spacious, modern suites featuring a large lounge with a sofa, chairs, cocktail table and bar, as well as ocean views and Club Sandals* service. Italian Bi-Level 1 Br. Butler Suite w/Balcony Tranquility Soaking Tub - Found in the charming Italian Village, these contemporary Love Nest Suites boast chic decor, a writing desk, a parlor area, a sofa, a wet bar, and a very large balcony adorned with a dining table and soaking tub for two. These romantic retreats also offer pool and garden views, as well as Butler Elite* and 14-hour room service. Italian Swim up Bi-level 1 Br. Butler Suite w/Patio Tranquility Soaking Tub - Located in the Italian Village, these luxurious Love Nest Suites are stylish and romantic, with the same amenities as before plus a private entrance to the zero-entry river pool. Butler Elite* and 24-hour service is also included. 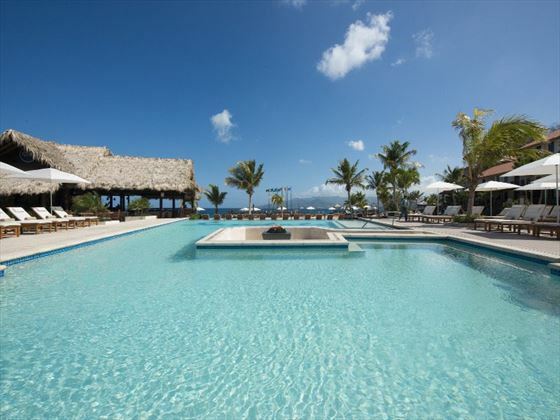 South Seas One Bedroom Butler Villa with Infinity Edge Pool - Tranquil suites offering utmost privacy with their hillside location. These sanctuaries include a separate bedroom, direct access to a private infinity edge plunge pool, a whilrpool, an outdoor shower, a living room with a wet bar, and outdoor dining area, a private terrace, and Butler Elite* and 24-hour room service. South Seas Grande Rondoval Butler Suite with Private Pool Sanctuary - Unique Love Nest Suites boasting rustic thatched roofs, a luxury bedroom with direct access to a private infinity edge plunge pool, a living area with an indoor dining area and wet bar, his and hers vanities, a large patio with a whirlpool and waterfall, chaise lounges, and an outdoor dining table. Elite Butler* and 24-hour room service is also provided. Italian Oceanview 1 Br. SkyPool Butler Suite w/Balcony Tranquility Soaking Tub - You'll find these idyllic suites on the third, fourth and fifth floors of the Italian Village, boasting a huge bedroom with direct access to a private solar heated plunge pool with an infinity edge, a living room with a dining table, writing desk, smart TV, butler pantry and wet bar with premium spirits, and a spacious balcony with a soaking tub and some with an oversized day bed. Butler Elite* and 24-hour room service is included. South Seas Honeymoon One Bedroom Butler Villa with Private Pool Sanctuary - Offering true seclusion, these romantic suites have the joy of having a personal butler, as well as an elegant bedroom with a smart TV, plus an expansive living area with a sofa, dining area, another TV and a wet bar. 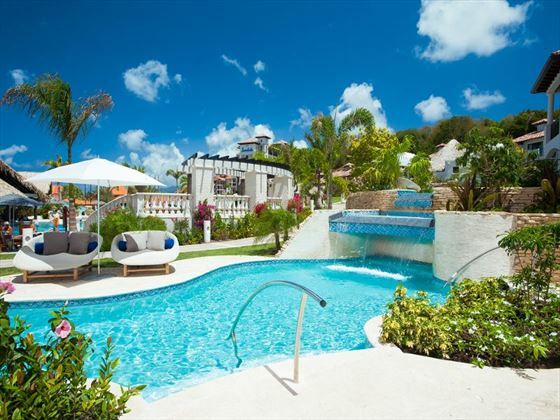 Venture outside and you'll find a private sundeck adorned with a plunge pool and a whirlpool. Butler Elite* and 24-hour room service is available. Italian Oceanview PH. 1 Br. SkyPool Butler Suite w/Balcony Tranquility Soaking Tub - The most magnificent of accommodation choices, perched on top of the Italian Village. 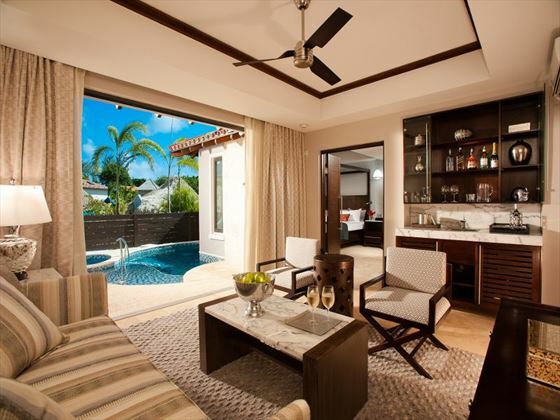 These spectuacular suites feature direct access to a private solar heated infinity edge plunge pool, a lounge with a dining area, a writing desk, a butler pantry and a wet bar with premium spirits, and a gorgeous balcony with a soaking tub and ocean views. Also boasting Butler Elite* perks and 24-hour room service. *Butler Elite - enjoy the ease of never having to lift a finger with your own personal butler. The butler service here is outstanding, with perks including welcome cocktails, serving you lunch on the beach or by the pool, making dinner reservations, and even tending to your wardrobe. 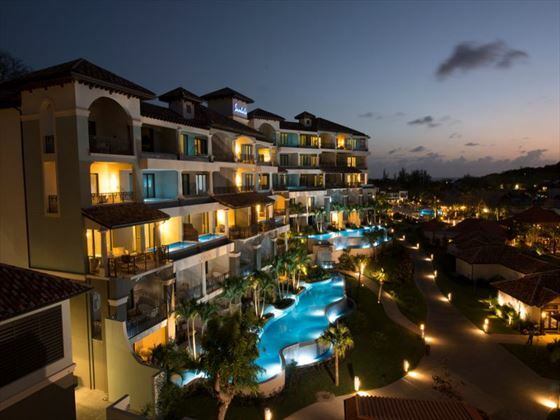 *Club Sandals - indulge in a suite with access to Club Sandals, a luxurious lounge with lovely views, all-day snacks, a coffee machine, board games, flat-screen TVs and soothing background music. Perks also include being escorted to your room upon arrival, having your own robe in your room, personalised resort orientation, and access to the weekly cocktail party. 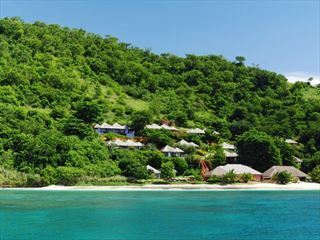 Wide range of non-motorised water sports to include snorkelling, windsurfing, canoes/ kayaks, hobie cats, paddle boarding etc. Evening entertainment daily including beach parties, fashion shows, live music, talent shows, lovers night etc.